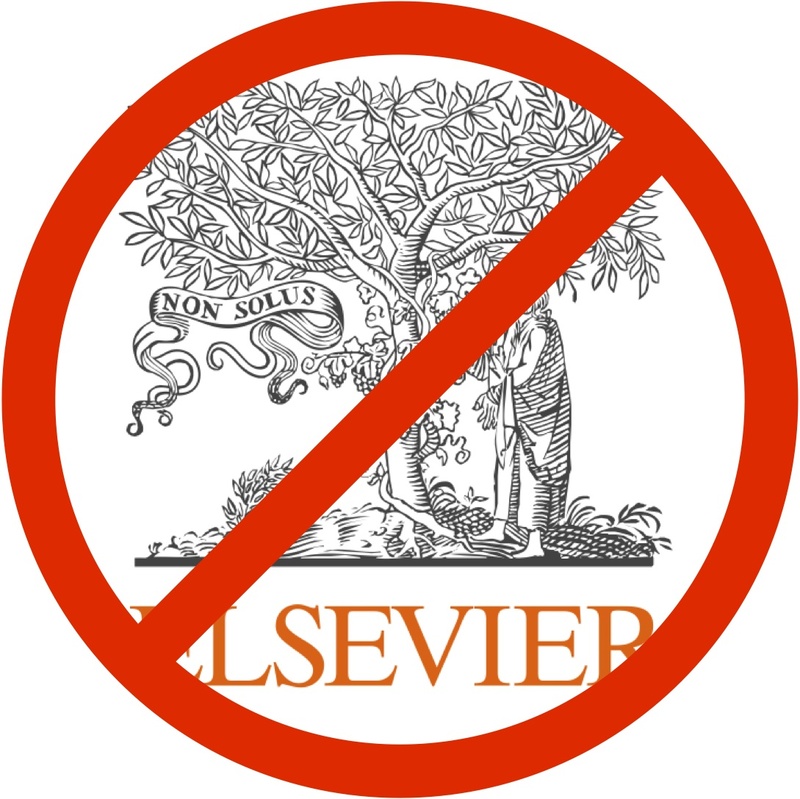 Readers of this blog probably already know that there's a call out to boycott journals published by Elsevier because of their anti-scientific publishing practices. Initially researchers were signing a pledge to not contribute to Elsevier's activities, by refusing to publish in, referee for, or do editorial work for any Elsevier journal. I've signed this (at The Cost of Knowledge), and you should too. Jon Eisen has now expanded this, asking that researchers also refrain from promoting work published in Elsevier journals (Boycotting Elsevier is not enough - time to make them invisible). Don't write blog posts about them, don't choose them for journal club, don't even cite them if a reasonable alternative is available (he didn't say that last one, but I do). Elsevier doesn't have a list for Evolution or any related topic, so I did a search. Although that identified 179 journals, most are not focused on evolution. Here's a link to the first 25 on the list. Well... I think boycott is easy when you have a good job position as scientist. But for young scientists, grad studients and post-docs, it seems to me a dangerous way. If my paper is only published by Elsevier, I will be happy, very happy. Because I'm a young scientist and I need publishing... Or I wil perish very soon. As a grad student myself - I disagree with Guillaume44. There are plenty of journals out there. Therefore in most fields it's very likely that there are good or even BETTER journals that one could publish in, instead of an Elsevier journal. So I don't see it as that difficult to achieve, even for younger scientists. If your supervisor disagrees with you, try and persuade them - if you're first author - you should have the biggest say in where it gets published, right? It's certainly not worth falling out with your supervisor, but at the same time, it cant hurt just to say "I don't want to publish my work in Elsevier journals". Ross, if you can publish without problems in another journal than Elsevier's, you're very luky. In my field research, the best journal (Harmful Algae) is published by this editor. Guillaume, that's very true and I don't think anyone is suggesting that young researchers should take risks with their careers. This is something that, as you say, those of us with comfortable tenured positions and some security should be pursuing. That said, I hope you will feel able to raise the issue and lobby for better journal choices for your papers. Remember that money that is spent on journals that overcharge is money that is not spent on research. We all want to build a sustainable future for research. Except there are hundreds of good journals. Instead of Cell, go EMBO, MCB, PLoS Biology, PNAS, etc. I know impact factor is slightly important to bean counters, but what is more important to promotion committees is how your publications affect on your field. Also, fewer and fewer scientists are reading hardcopy journals. A large and growing number (dare I say most), get table of contents sent to their inbox and read/print out those papers of interest. So being in journal X is of slightly decreasing importance than it once was. More important is that the paper is published and the work good so that others read it. 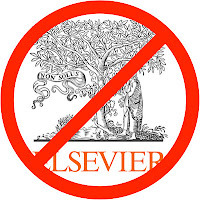 I support the effort to boycott Elsevier, as far as decline offers to edit or review and choosing other journals for ones own publications. This expansion of not promoting work published in Elsevier journals I have more of a problem with. Good scientific work goes into these journals, from scientists who are less informed about the dubious practises of Elsevier, who care less or who are not yet in the privileged position that they can choose freely where to publish. Not citing them, not blogging about them or deliberately not reading them, disrupts the spread of legitimate work. It is the purpose of this boycott to ensure that high quality scientific publications reaches a wider audience, and I think taking it too far risks being counter productive, even in the long run. You may be interested in the White House petition on this the Research Works Act (http://wh.gov/K25). It needs 25000 signatures by Feb 22nd.It currently stands much less than this. Could you repost this and forward to get more signatures?